1. Lower blood pressure (when high). A recent study at London’s Queen Mary University found that one glass of beet juice daily was more effective at lowering high blood pressure than medication. Of course, this doesn’t mean you should stop taking medication if you have high blood pressure. But, it does mean that adding a cup of beet juice and more beets to your diet could be helpful in the treatment of high blood pressure, angina and heart disease. 2. Anti-inflammatory. 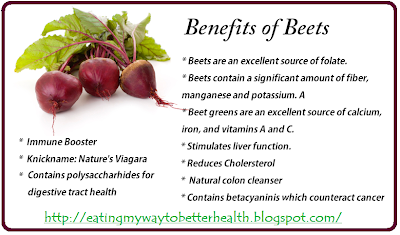 Raw beets or raw beet juice contain betaine — a natural anti-inflammatory that helps protect against aging and disease. 3. Increase exercise endurance. A study at England’s University of Exeter found that eating foods rich in naturally-occurring nitrates, like beets, improved endurance during exercise. The scientists studied various substances and training methods to see which, if any, would improve stamina. Beet juice had the greatest effect, improving peoples’ ability to exercise for 16% longer than without it, without tiring. Naturally-occurring nitrates have been shown to widen blood vessels and allow more oxygen-rich blood to travel to the heart. And, while I’m not aware of any studies, I’m sure that the increased stamina and improved circulation from beet consumption may transfer to the bedroom as well. 4. Anti-cancer effects. The phytonutrient, proanthocyanidin that gives beets their rich purplish color is also a potent anti-cancer compound. Meanwhile the fiber found in beets also helps protect against cancer. This particular fiber increases the body’s ability to detect and remove abnormal cells in the body before they can become cancerous. 5. Boost immunity. Beets are high in vitamin C, which boosts the immune system. 6. Reduce the risk of birth defects. Beets are high in the B-complex vitamin folate which when consumed by pregnant women have been shown in many studies to reduce the risk of birth defects in the baby. 7. Rich in essential minerals. Beets are also high in the minerals manganese and potassium. Manganese is required for healthy bones, liver, kidneys, and pancreas. Potassium helps ensure healthy nerve and muscle function. 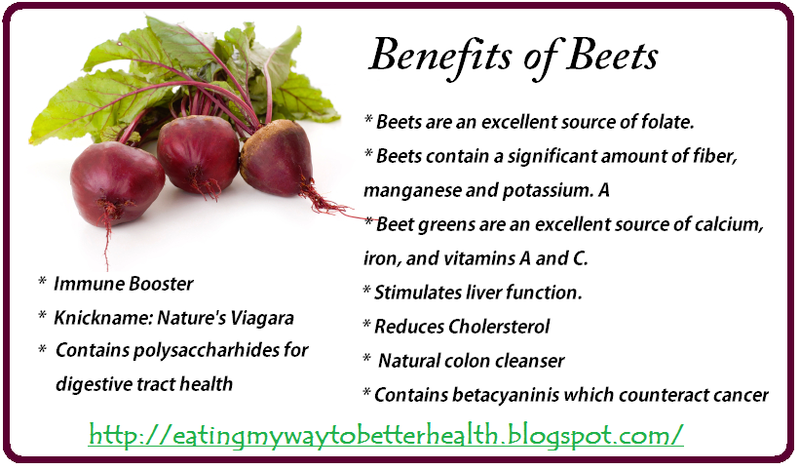 You can enjoy raw beets grated on a salad or juiced, and cooked beets in soups and stews. I love steamed beets tossed with a little flax oil (don’t cook the flax oil though) and sea salt.